Promoting open access education as a basic human right drives the work of Roland van Oostveen, PhD, Associate Professor in the Faculty of Education at the University of Ontario Institute of Technology (UOIT). For the past few years, he has been leading the implementation of new technologies in education and rigorously using social media to allow people to better themselves and follow their dreams for the benefit of society. His pinnacle work includes UOIT's EILAB, an advanced research network focused on the development of collaborative online learning environments, offering bold, new insights and helping to shape the way students learn in the 21st century. As Administrative Director, his research also involves the development of assistive technology, and testing of tablet-based stylus editing software; the development of a theoretical model for Problem-Based Learning Objects (PBLOs); and the investigation of technologies involved in e- and m-learning. Dr. van Oostveen is the founding director of UOIT’s BA in Adult Education and Digital Technology (recently renamed as the BA in Educational Studies and Digital Technology) program, which brings together learners from around the world in a vibrant online community where collaborative, problem-based learning (PBL) can occur. Students are given remote access to synchronous and asynchronous video conferencing, blog space, Google Drive and Skype. Inspired by the revolutionary learning philosophy of MIT’s Dr. Seymour Papert, Dr. van Oostveen joined UOIT in 2003 as an Assistant Professor with a unique vision for integrating technology in education. In 2008, he became an Associate Professor (tenured), and served as Director of Bachelor of Education programs between 2010 and 2011. He earned his Bachelor of Science (Honours) in Marine Biology from the University of Guelph in 1981, and obtained both his Master of Education and Doctorate in the Department of Curriculum, Teaching and Learning Concentrations in Science Education at the University of Toronto’s (U of T) Ontario Institute for Studies in Education (OISE) in 1997 and 2005, respectively. For 18 years he taught science to elementary and secondary school students and served as Science Department head in Alberta and Ontario, and curriculum coordinator with the Toronto District School Board. He also served as Instructional Leader of the Intermediate/Senior Mathematics/Science Department at York University’s Field Development Office. 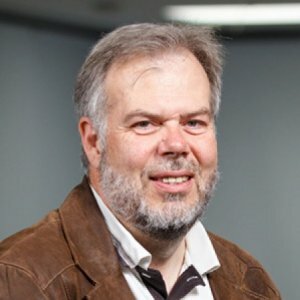 Founding Director of UOIT’s BA AEDT, Dr. van Oostveen is advancing collaborative online learning environments using Adobe Connect AV conferencing systems to create virtual face-to-face learning where students work together in small groups to solve problems. He has developed and taught undergraduate courses including Foundations of Digital Teaching and Learning Technologies, and Teaching and Learning Problem-Based Learning. He has also taught the graduate course Learning With Technology. UOIT’s EILAB is a state-of-the-art observational research hub for university based projects and research collaborations from around the world. Facilitated by Dr. van Oostveen, the highly equipped facility supports social-scientific research in the field of learning and digital technology. Dr. van Oostveen and a team research colleagues co-authored an award-winning paper outlining how online environments provide accessible learning opportunities, where learners can also be teachers and teachers can also be learners. The research was recognized at the Association for the Advancement of Computing in Education’s (AACE) 2016 World Conference on Educational Media and Technology in Vancouver, British Columbia.